Sarah, the artisan behind Artizen Metal on Artfire is a highly creative individual. She is constantly exploring different themes. Shown here is my favorite of her past collections, Tales from Microbia. 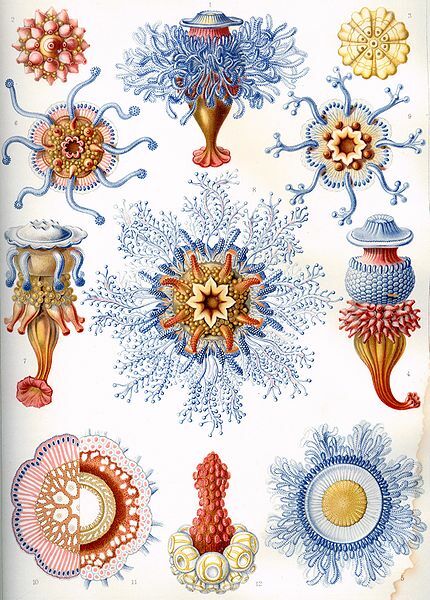 The designs were inspired by Ernst Haeckel's (1834-1919) lithographs of cells and radiolarians which are beautiful single cell organisms. 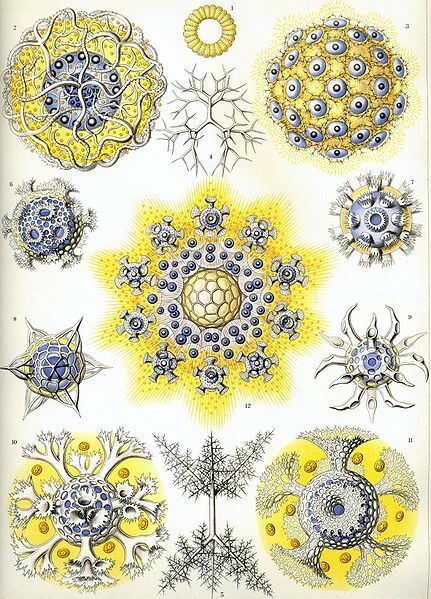 This German biologist produced some of the most amazing illustrations of the natural world in his 1904 book, Kunstformen der Natur (German for Art Forms of Nature). Shown below are a couple of his exquisitely detailed drawings. For more pictures see here. Sarah created this limited edition - one of her favorites - back in 2009. Although it is sold out, she does indeed take custom orders! You can also check out her current collection which is entitled Chakra Petals in her store. I love these illustrations. They are so fantastic (in both senses of the word). And her jewelry is gorgeous, too! Thanks. I have a Dover edition of this same book which fascinates me. So I love these pieces! You're too funny, Carol! My first thought wasn't to wash my hands but wondering where I can get hold of a copy Ernst Haeckel's book. I too love those illustrations. So I am jealous of anyone who has one! Lucky you, Cate! I love it when science and art mingle. Beautiful micro illustrations and beautiful jewelry.